I love pasta and I love this recipe for a very special reason. Pasta all’Arrabbiata saved quite a few weekends when I forgot to get groceries before the stores close. Or when I was just too lazy to get out. Most countries have tons of mini markets where you can get stuff 24/7. I tell you, this is not the case in Austria. We have a grocery store on almost every corner but we’re pretty strict with our opening times. Not long ago in Austria, when I forgot to get my groceries by 5 pm on a Saturday, I had to make do with what I have. All the Stores were closed, until Monday, 8 am. Nobody was starving on a Sunday afternoon at home (and there was always Praterstern to save you if you were really desperate) but more often than not I made do. One option was ordering food, but where I lived* there was not much to order. And the quality of Chinese takeaway or lukewarm pizza never really convinced me. 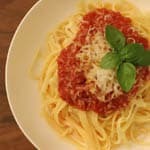 Having an empty fridge never kept me from cooking, so I usually went for a simple pantry dish like Pasta Al’Arrabbiata. Or Spaghetti aglio e olio or Spaghetti alla Puttanesca. But those pasta recipes are for another time. I’m not so desperate on weekends anymore because opening times got more liberal in the recent years (6 pm!) and new, mostly Turkish minimarkets made it possible to get milk on a Sunday. Nonetheless, I still love my quick and easy pasta dishes. 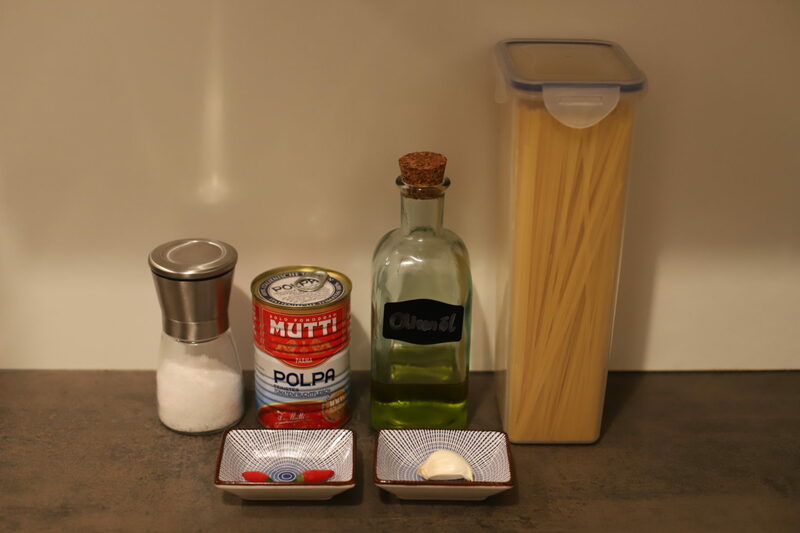 For Pasta all’Arrabbiata you need only a handful of ingredients and you can prepare in under half an hour. It’s super satisfying soul food and can be adapted to almost every taste. You like it spicy? Me too, make it hot. Garlicy? Hell yeah, but I’ll show you some tips and tricks to reduce the garlic taste if you’re not too fond of it or if you want to kiss someone tonight. You probably have most of the ingredients already at home, so there’s no reason not to try it. 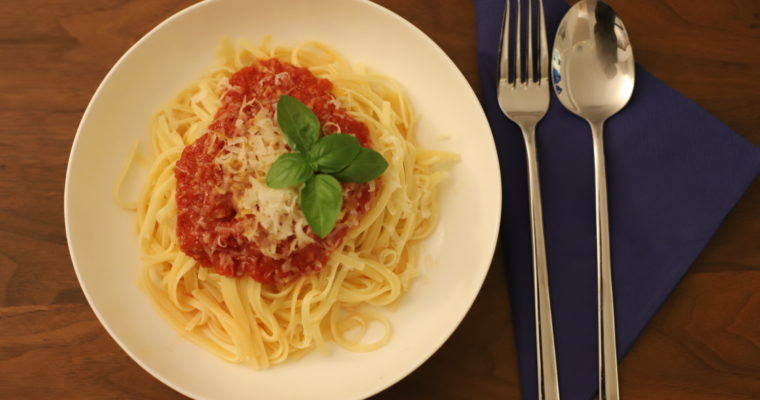 And never underestimate Pasta all’Arrabbiata: You can serve it with a glass of red wine on the side and transform this classic into a fancy dinner. Your vegetarian friends will love it. This recipe makes enough sauce for two dinner portions. For starter size portions it's good for four people. Heat the olive oil in a pan and cut the garlic and chili into small pieces. 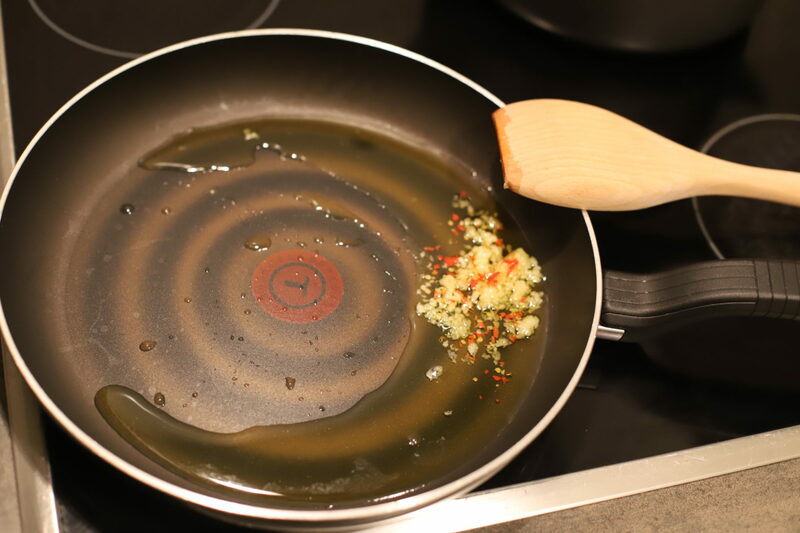 On medium heat, fry the garlic and chili in the oil for 1-2 minutes. Don't let the Garlic turn brown. Add the canned tomatoes to the hot oil. If using whole canned tomatoes, mush them with your hands before adding to the pan. Turn the heat to low and let the sauce simmer for about 15 minutes. Stir occasionally. While the sauce is cooking, bring a pot of water to boil, salt it and cook the pasta in it. 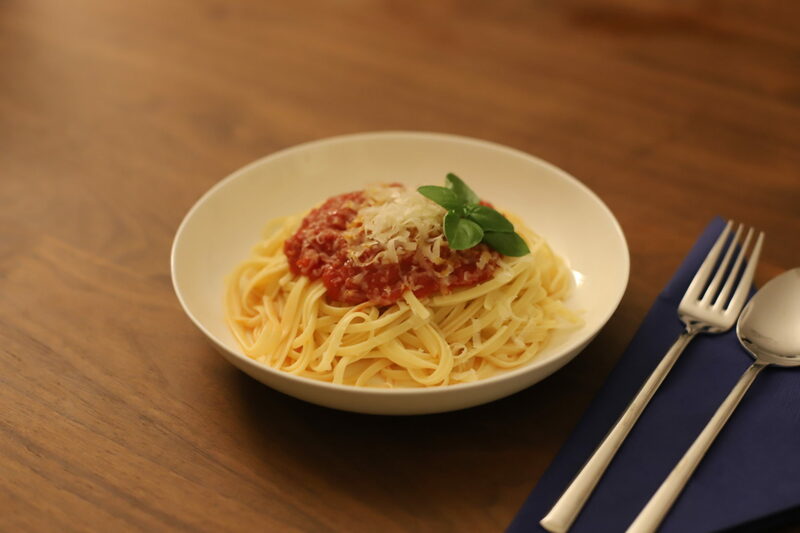 When the pasta is cooked, serve it with a dollop of the sauce on top, some grated parmiggiano reggiano and some fresh basil. Don't fry the garlic too long or it will get a bitter taste. If you want a stronger garlicy flavor, fry it only for a very short time. If the taste of garlic is too much, you can make the recipe milder by frying a whole garlic clove in the pan instead of a chopped one. Remove the clove before adding the tomatoes. 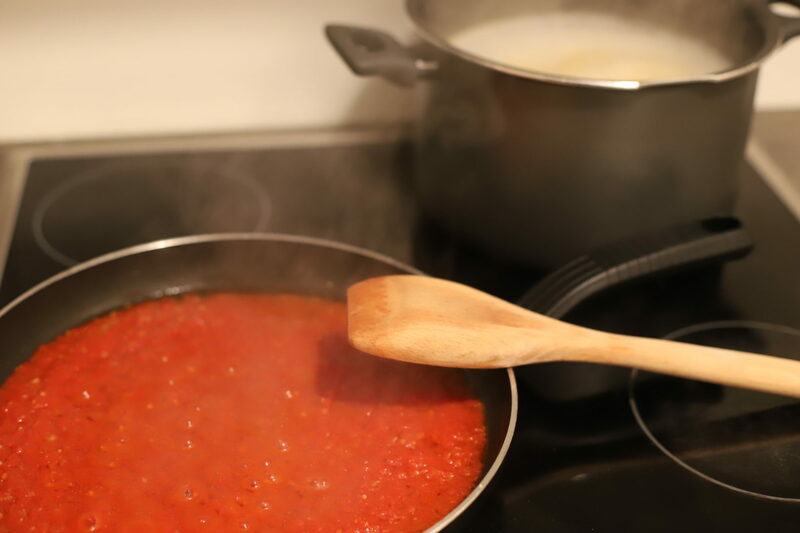 You can improve the taste of bland or sour tomatoes by adding a teaspoon of honey to the sauce. Honey is not necessary if the tomatoes are of high quality. Adjust the amount of chili to your taste and to the chilis used. You can also use dry chili or chili paste if you've no fresh chilis are available.